The volcanoes on Mars are true giants. 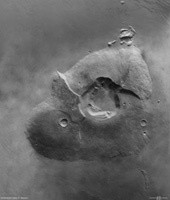 As well as being home to the largest volcano in our Solar System, the 24-kilometre-high Olympus Mons, and its three neighbouring shield volcanoes Arsia, Pavonis and Ascraeus, there are a number of less-frequently observed volcano complexes on the Tharsis bulge near the Martian equator that also reach impressive heights. 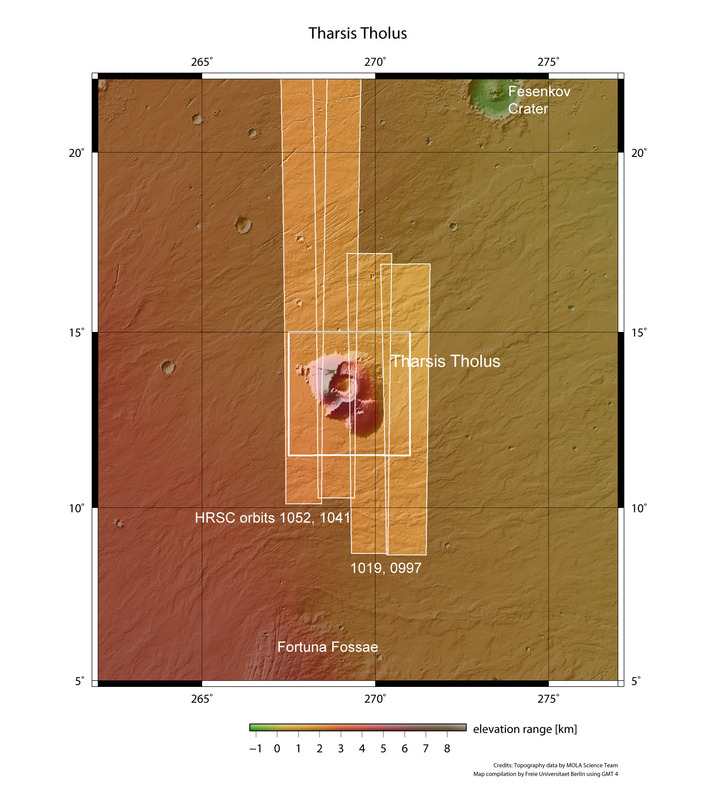 With a base measuring 155 by 125 kilometres, the 8000-metre Tharsis Tholus may only be a 'mid-range' volcano, but when measured against terrestrial standards, this volcano is truly gigantic. 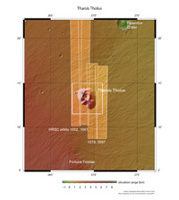 The High Resolution Stereo Camera (HRSC) operated by the German Aerospace Center (Deutsches Zentrum für Luft- und Raumfahrt; DLR) on board ESA's Mars Express spacecraft acquired images of Tharsis Tholus over the course of several orbits, which have been combined to form a mosaic image with a resolution of 14 metres per pixel. The images show an area located at 13 degrees north and 268 degrees east. Just as on Earth, volcanoes on Mars played an important role in both its climatic history and the thermal evolution of its interior. Volcanic eruptions fed 'fresh' gases into the atmosphere, thereby affecting the density and composition of this gaseous envelope. Whether a water cycle existed on Mars or whether it once rained are some of the most exciting questions addressed by Mars exploration. Closely related to this is the question of whether conditions were ever favourable for the development of life on the now dry planet. 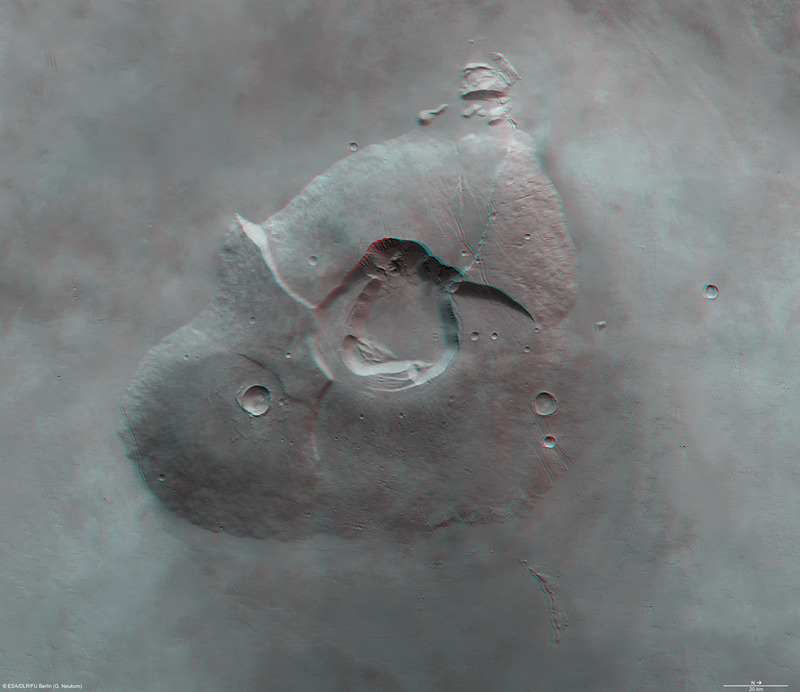 Tharsis Tholus differs from many of the other volcanoes on Mars in that its edifice has undergone extensive modification. The complex has not developed in the usual way, for example as a cone or a shield surrounding the volcanic centre; instead, it shows signs of substantial deformation. At least two major collapses on the western and eastern flanks have taken place in the course of its four billion year history. Evidence of these events is still visible, taking the form of the steep flanks some several kilometres in height, as well as concentric and ring faults. 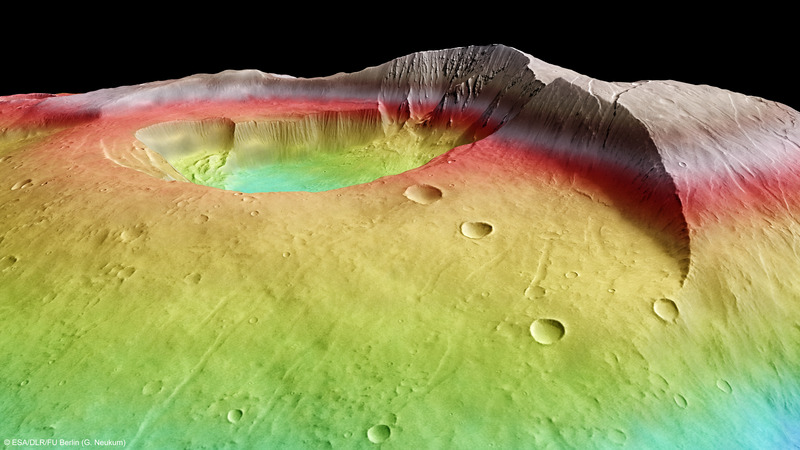 The main feature of Tharsis Tholus is, however, the size of its central caldera. 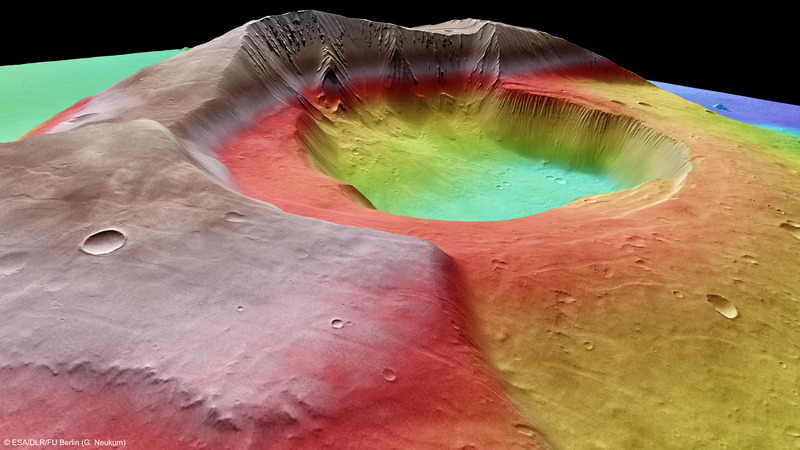 This slightly elongated collapse crater at the summit of the volcano, measuring roughly 32 by 34 kilometres, extends over an area almost as large as Berlin and the base is as much as 2.7 kilometres below the rim. The caldera may have formed when a shallow magma chamber under the volcano emptied, primarily through volcanic eruptions - during which the magma emerged at the surface in the form of lava. This emptying process caused a large cavity to form inside the volcano. As lava accumulated over this cavity, there came a point when it could no longer support the additional weight and it collapsed, forming a depression known as a 'collapse caldera'. But the true size of Tharsis Tholus is concealed. 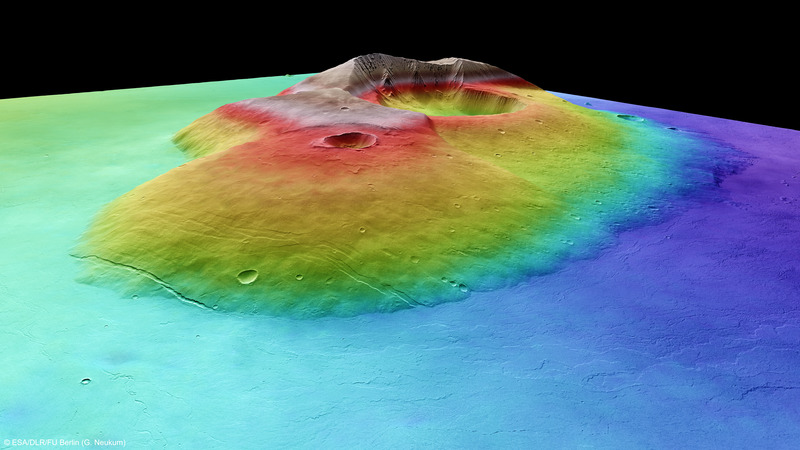 As the nadir image shows, the volcano is surrounded by numerous solidified lava flows, hiding the original base of the volcano. 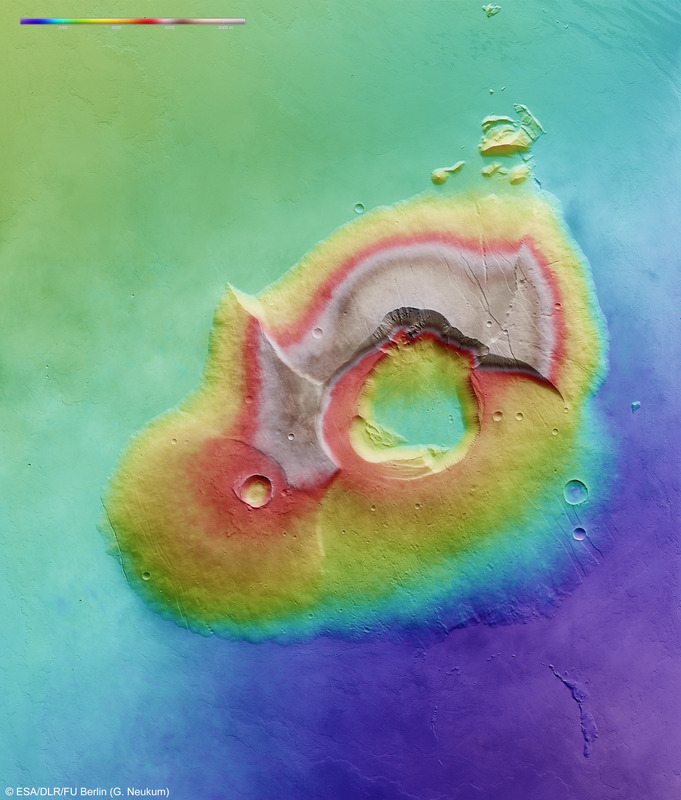 Taking into account the number and massive extent of these lava flows, it is possible that Tharsis Tholus is 'submerged' in lava to a depth of several kilometres. Planetary Sciences and Remote Sensing in the Institute for Geological Sciences of the Freie Universität Berlin. The perspective views were computed from the HRSC stereo channels. The anaglyph was derived from one stereo channel and the nadir channel, which captures image data at the highest resolution of all the channels. The black-and-white detail image was acquired with the nadir channel. The false-colour images are based on digital terrain models of the region, from which the topography of the landscape can be derived. 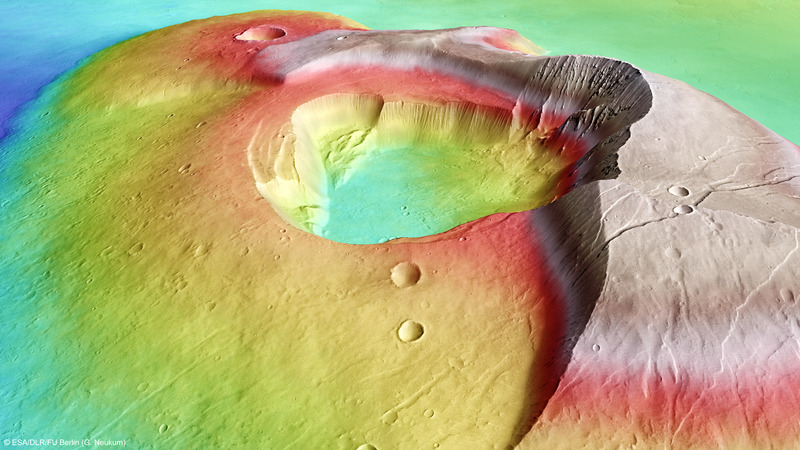 Mars continues to be one of the most important targets for planetary research. On 25 November, NASA's Mars Science Laboratory, a lander carrying a rover named Curiosity, will be launched on its journey to the Red Planet. Curiosity is five times heavier than the two 'veteran' rovers, Spirit and Opportunity, which have been exploring the Martian surface since 2004. Equipped with the most comprehensive and sophisticated suite of experiments, Curiosity will continue the quest to find evidence for the existence, past or present, of organic molecules on Mars. Even the Russian space programme will again contribute to the exploration of Mars; on 5 November 2011, the Phobos Grunt spacecraft will embark on its journey to Phobos, the larger of Mars' two moons (see also PRs #409, #455, #460, #492). Once it lands in 2013, the small lander will collect samples for roughly a year. The loaded return vehicle will then blast off from Phobos and arrive back at Earth in 2014. DLR is participating in this mission by developing digital terrain models derived from HRSC image data, to support the Russians in the selection of the landing sites. Though manned missions to Mars are in the distant future yet, the Mars500 long-term experiment will help with preparations. In this experiment, the subjects embarked on a 520-day virtual flight to Mars inside a simulated spaceship. This journey will come to an end on 4 November, when they will 'return to Earth'. The High Resolution Stereo Camera (HRSC) experiment on the European Space Agency's Mars Express mission is led by the Principal Investigator (PI) Prof. Dr Gerhard Neukum, who was also responsible for the technical design of the camera. The science team for the experiment consists of 40 co-investigators from 33 institutions and 10 nations. The camera was developed at DLR under the leadership of the PI and it was built in cooperation with industrial partners EADS Astrium, Lewicki Microelectronic GmbH and Jena Optronik GmbH. The instrument is operated by the DLR Institute of Planetary Research, through ESA/ESOC. The systematic processing of the HRSC image data is carried out at DLR. The scenes shown here were processed by the PI-group at the Institute for Geological Sciences of the Freie Universität Berlin.